"I would highly recommend E-Z car Credit to anyone. They have the best customer service anywhere!" "These guys are great! 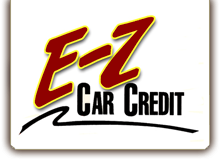 If you are looking for some nice helpful people to put you in a quality car, come to E-Z Car Credit!" "My life has changed since I bought my car from E-Z Car Credit! I've built my credit and saved so much money not having to take my car to shop every month. Best of all the staff is wonderful!" "The staff at E-Z Car Credit is wonderful! I have really enjoyed my experience with them during the last 2 years. I recommend them to all my friends and family and plan on purchasing my next vehicle from them." "I would recommend E-Z Car Credit to anyone who is looking for a new car. They were so helpful and nice once I got there. The hands on face to face information and the explanation of everything was great! Thanks for being so nice & helpful, I love my car!" "E-Z Car Credit worked with me in my time of desperation, I could go on and on. They are wonderful people!" "E-Z Car Credit has been good to me. I won't go to any other place to get a car. The only reason I would leave is if E-Z Car Credit left. The staff is very good to me." "I've been with E-Z Car Credit for over 10 years. I could go to other car lots, but I chose them because they stand behind each and every vehicle they sell. They sell dependable cars and trucks!" "My experience with E-Z Car Credit was good from start to finish. I have always been treated fair ever since the sale of my car. I am pleased and would buy from them again". "My Husband and I were looking for a vehicle for him. He drives an hour a day to work and back so he needed something reliable. We stopped at E-Z Car Credit and they found what my husband wanted, a Jeep! They went above and beyond and when there was something wrong, they took care of it right away!" "The staff at E-Z Car Credit was very helpful in helping me find my van. My family & I love this van, it is very reliable and wonderful to travel in! Thank you E-Z Car Credit!" "I am purchasing my 3rd vehicle from E-Z Car Credit. I have not had any problems outside of normal wear issues on any of them. The staff is helpful & friendly. "We have never had a better sales experience and you went above our expectations. We love our truck and can't thank you enough for being so wonderful to us. We have told several people to come see you! You guys are awesome!"